In any community of Saints, we all work to serve each other in the best way we know how. Our work has a higher purpose because it is work to bless others and to build the kingdom of God. We all have life events that, when we recall them years later, acquire new and important meaning. When I was in junior high, I was honored by the school administration when I was asked to become a member of the student hall patrol. On the days we were assigned to be on hall patrol, we were instructed to bring our lunch to school and eat it together. It was always a special treat, and there was always a lot of competition to see whose mother had prepared the most desirable lunch. Often we traded lunch items among ourselves. One day when I was assigned to be on hall patrol, I forgot to tell Mother that I needed a lunch until I was almost ready to leave for school. An expression of concern came over Mother’s face when I requested a lunch. She told me that she had just used up her last loaf of bread for breakfast and would not be baking until that afternoon. All she had in the house to make a lunch was a large sweet roll left over from the previous night’s supper. Mother made delicious sweet rolls. She always arranged them in a pan so there was one large one across the top of the pan and then rows of smaller ones down the length of the pan. Only the large one remained. It was about the size of a loaf of bread in length but, of course, not in thickness. I was embarrassed to take just a sweet roll for lunch when I imagined what the other patrol members would have, but I decided it was better to go with the sweet roll than go without lunch. When it came time to eat lunch, I went to a far-off corner so I wouldn’t be noticed. When the trading of lunches started, my friends wanted to know what I had. I explained what had happened that morning, and to my dismay, everyone wanted to see the sweet roll. But my friends surprised me﻿—instead of making fun of me, they all wanted to have a piece of the sweet roll! It turned out to be my best lunch trading day of the entire year! The sweet roll that I thought would be an embarrassment to me turned out to be the hit of our lunch hour. As I have reflected on this experience, it has occurred to me that it is often part of human nature to attach less value to familiar things simply because they are so common to us. One of these familiar things could be our membership in the restored Church. What the members of the Church possess is a “pearl of great price,” yet sometimes this priceless gem is so familiar to us that we do not appreciate its true value. While it is true that we should not cast our pearls before swine, this does not mean we should not share them with people who will appreciate their value. One of the greatest side benefits of missionary work is watching the great value that others who have not previously heard about our beliefs attach to them. There is a great benefit in seeing one’s treasures through someone else’s eyes. 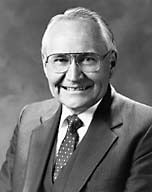 My concern is that we often take for granted the unique and valuable blessings that we have of membership in the Lord’s Church, and in such a state of underappreciation we are more likely to be complacent about our Church membership and are less valiant contributors to building a community of Saints. We are blessed with a great and noble heritage that offers a pathway to truth that veers dramatically from the so-called ways of the world. We need to remind ourselves about the value of our heritage so we do not underestimate its worth. I challenge the many Saints who are hiding in the corners to stand tall and proclaim loudly the treasured teachings of our common heritage, not with a spirit of pride or boasting but with a spirit of confidence and conviction. Something about which I am most proud is how our forefathers, through their faith in God and their industry and perseverance, turned places that nobody wanted into beautiful cities. When Joseph Smith was incarcerated in Liberty Jail, with no prospect of release, an extermination order had been issued against the Saints. This made it necessary for Brigham Young to organize the Saints to move them from Missouri. The migration from Missouri in February of 1839 caused many to complain that the Lord had forsaken His people. Some of the Church members questioned the wisdom of once again gathering the Saints together in one location. Crossing the Mississippi and pausing in some of the smaller communities along its banks proved to be a respite necessary for the membership to receive new direction from their leaders. The Prophet Joseph Smith wrote from Liberty Jail, encouraging the Saints not to scatter but to gather together, then build from centers of strength. In April of that year, Joseph and Hyrum and their fellow prisoners were allowed to escape from the jail in Missouri. They arrived in Quincy, Illinois, on the 22nd day of April of 1839. The Prophet immediately went to work to find a place to gather the Saints. He found a spot on the banks of the Mississippi River that looked like it had promise. He named the city Nauvoo, meaning “beautiful,” but at that time it was anything but beautiful. It was a swampy peninsula that had not been drained. Out of the swamp-infested land rose a city that could truly be called beautiful. The first homes in Nauvoo were huts, tents, and a few abandoned buildings. Then the Saints started to build log cabins. As time and capital would allow, framed buildings were erected, and, still later, more substantial brick buildings were built. The Prophet had a design to build a community of Saints. He had three major objectives: first, economic; second, educational; and third, spiritual. The Prophet Joseph Smith’s desire was that the Saints should become economically self-sufficient. Our Father in Heaven has given all of His children everything they have﻿—their talents, their abilities, their material goods﻿—and has made them stewards over these blessings. “Let us love one another: for love is of God; and every one that loveth is born of God, and knoweth God. “Beloved, if God so loved us, we ought also to love one another” (1 Jn. 4:7–9, 11). Then in 1 John, the third chapter, he wrote: “But whoso hath this world’s good, and seeth his brother have need, and shutteth up his bowels of compassion from him, how dwelleth the love of God in him?” (1 Jn. 3:17). It is our understanding of the principle of love that encourages us to give generously to the fast offerings, a wonderful, revealed system in which on the first Sunday of each month, we voluntarily refrain from eating two meals and contribute the cost of those meals to our bishop. He then has the resources to help him help those in need. The system is mostly painless, and it raises our appreciation for those who are without and provides a means to satisfy their daily requirements. May the Lord continue to bless us with the desire to love one another and give generously based on the principle of the fast. The second basic principle is that of work. Work is just as important to the success of the Lord’s economic plan as the commandment to love our neighbor. “These things ought not to be, and must be done away from among them” (D&C 68:31–32). I have a special concern about the Lord’s reference to our children. We see evidence of many parents who overindulge their children without adding sufficient training about the value of work. The second requirement in the Prophet Joseph’s community of Saints was that of education. As early as 1840, when he applied for the incorporation of Nauvoo, he also asked for authority to establish a university. From the Encyclopedia of Mormonism we read, “Educational ideas and practices of the Church grew directly out of certain revelations received by Joseph Smith that emphasize the eternal nature of knowledge and the vital role learning plays in the spiritual, moral, and intellectual development of mankind” (“Education: Attitudes Toward Education,” in Daniel H. Ludlow, ed., Encyclopedia of Mormonism, 5 vols. , 2:441). There are verses in our modern scripture that make special mention of the importance of secular and spiritual learning. A few of these are, first from the Book of Mormon, “But to be learned is good if they hearken unto the counsels of God” (2 Ne. 9:29). “And if a person gains more knowledge and intelligence in this life through his diligence and obedience than another, he will have so much the advantage in the world to come” (D&C 130:18–19). From the Articles of Faith, “If there is anything virtuous, lovely, or of good report or praiseworthy, we seek after these things” (A of F 1:13). The final desire of the Prophet Joseph Smith was to build a community of spiritual Saints. This begins in the home. The most important instruction our children will ever receive will be that which parents give to them in their own home, if parents diligently teach their children the way our Father in Heaven would like them to follow. One instruction our leaders have given us is to hold regular family home evenings where we can meet together weekly, learn gospel principles, and build family unity. Here we can counsel together, read the scriptures, pray together, and play together. Our greatest goal is to become an eternal family. We build a community of Saints one family at a time. To enable the eternal family, a magnificent temple was constructed in Nauvoo. It stood as a beacon to remind all the people that the most important blessings in life are spiritual blessings. In the temple, sacred covenants are made and the saving ordinances of the gospel are administered. Repeated visits to the temple give us an opportunity of renewing these covenants and performing ordinances vicariously for those who have died without these blessings. We now have temples scattered throughout the earth, giving many more the chance to receive the necessary ordinances to qualify for life eternal. Those who are worthy to enter the temple will receive great spiritual blessings if they continue to serve in faithfulness and keep their covenants. The Lord blesses His people when they keep His commandments and frequently visit His house. In God’s eternal plan, our temples are gathering places for communities of Saints working to build Zion. Our community of Saints is not one of exclusion but one of inclusion, built upon a foundation of apostles and prophets, Jesus Christ Himself being the chief cornerstone. It is open to all of us who love, appreciate, and have compassion for our Father in Heaven’s children. The dual foundations of our economic welfare are the principles of charity and hard work. It is a progressive community in which we educate our youth in courtesy and civility and also in the deeper truths of the restored gospel. Our community has a spiritual center, allowing us to live with the companionship of the Holy Spirit that guides and directs us in our lives. May God grant unto us the desire to live closer to Him so we may enjoy the blessings of peace, harmony, security, and love for all mankind﻿—the hallmarks of a community that is one with Him. He is our God. We are His children. This is my witness to you in the name of Jesus Christ, amen. Historical information is from Church History in the Fulness of Times (Church Educational System manual, 2nd ed. , 193–223).